Of all the underground Roman structures that made Rome the city it was in ancient times, it is the temples dedicated to the Indo-Iranian god Mithras that are perhaps amongst the most enigmatic. As spectacular as the subterranean catacombs or the miles and miles of still functioning sewer tunnels are, we know much less about what went on in the ancient eternal city’s estimated 35 mithraea – the underground meeting places of men who worshipped Mithras. In this contribution Sarah Smith, one of Archaeology Travel’s many regular readers, shares her travel tips and experiences from her recent trip to Rome. A few minutes walk up the road from the Colosseum (stop and peer over the railings into the remains of the Ludus Magnus – the gladiators’ barracks and practice arena) is the Basilica of St Clement. The church we see from the street today was built in 1108 AD. Once inside, you can not miss the beautifully painted ceiling or the original golden mosaic strikingly lit up in the apse. Taking it all in, it is not surprising to learn that the Basilica is widely known for its ancient art. Scholars tell us that after the newly-renovated Church of Santa Maria Antiqua (in the nearby Roman Forum) you are looking at the second largest collection of Early Medieval wall paintings in Rome. But for me, what I was so keen to see lies two storeys below street level. 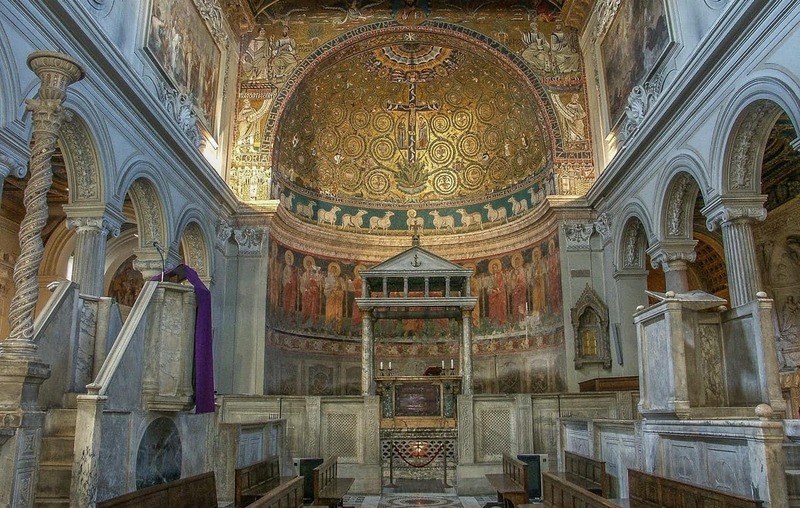 Looking into the apse with its gold-rich, 12th century mosaic. There is a fascinating story of religion in this place of worship. Around 200 AD the nobleman living on this very spot converted what was the central room of his house into a mithraeum – a temple dedicated to the god Mithras. A niche was created out of the doorway at the western end of the room, to hold the cult image. Also stone benches were constructed along either side of the room, these are typical of mithraea around the Roman Empire. Between these two benches and in front of the niche would have stood the altar of Mithras. Today a cast stands in its place, but the iconography and inscription is just as striking. On one of the four sides of the altar is an image of Mithras shown as a young man in the act of killing a bull. On the other three sides we see the twin torchbearers Cautes and Cautopates, and a snake – a symbol of regeneration. The inscription on the altar suggests that the mithraeum was set up by Gauis Arrius Claudianus who had reached highest level within the cult. The rough quality to the walls and ceiling, which is quite low, and the background sound of running water – down narrow steps is a channel of clear water, bubbling along pebbles – create an atmospheric space that is very cave-like. We call these religious structures mithraea, but for the Romans they were spelaea – or caves. And although the cult is poorly understood, we do know that communal meals were served to groups of men only. Besides various rooms for the house, other Roman remains include what is thought to have been a warehouse – some archaeologists have even suggested it was a mint. Sometime in the 4th century AD these rooms, including the mithraeum, were filled in and blocked off; the cult of mithraism was officially suppressed in 392 AD. The older remains formed a platform on which a church was built in the 5th century. A church that is now thought to be the one referred to by St Jerome when he wrote about a church dedicated to St Clement, a first-century Christian convert, Titus Flavius Clemens, who became Pope Clement I. Then, during the 11th and 12th centuries a newer basilica was built on top of the earlier church. This fascinating history of the site, from an early pagan ritual centre to a Byzantine church, came to light again when in the 1860s the Irish Dominicans who lived in the monastery began to remove the tons of rubble that had filled the earlier structures. Excavations are now conducted by archaeologists, when funds allow. When visiting the Basilica of Saint Clement today, you descend through layers of religious history: from the 12th century basilica to the 5th century Christian church, the Roman house and warehouse, and then into the mithraeum. From a popular tourist attraction in modern day Rome, a Christian church to a site of pagan cults and rituals of ancient Rome. Each period has its characteristic remains. But it was definitely the mithraeum that grabbed my attention. Apparently Mithras was a favourite god of Roman soldiers, and deep beneath the streets of Rome and the 12th century Basilica I could not help but wonder if the 3rd century Roman visitors here also attended spectacles staged at the Colosseum. For as long as I can remember I have had an interest in bloodthirsty gods and secret cults. So when planning my recent visit to Rome (April 2016) a visit to at least one Mithraeum was top of my list. To a somewhat gory delight I found that there are only about six Mithraic temples open to the public in Rome. Of the 35 odd mithraea, many are now closed to the public because they are too dangerous to visit or they are being excavated by archaeologists. As I found, just because one of these sites is said to be open to the public, it does not follow that you can just walk up to the door and hope to get in. Overlooking the fact that I was in Rome while Italy was celebrating a national holiday, which meant a lot of sites were closed those days, not all of the mithraea in Rome are open every day. Some are only accessible a few days each month, and even on those days for a few hours. Entry to some is only possible with a guided tour, which you have to book in advance. My experience is the mithraeum under the Basilica di San Clemente has the least restrictions, and does not require a prior reservation. And the experience? Well, it was everything I hoped it would be. While digging beneath the Teatro Nazionale dell’Opera in the 1930s, builders came across a mithraeum – now three storeys beneath the street level. Known as the Mithraeum of the Circus Maximus, a number of private tour companies offer tours of the ruins. Prices vary, from about €6 per person for a one hour tour of the ruins, to €70 for a two hour private tour. 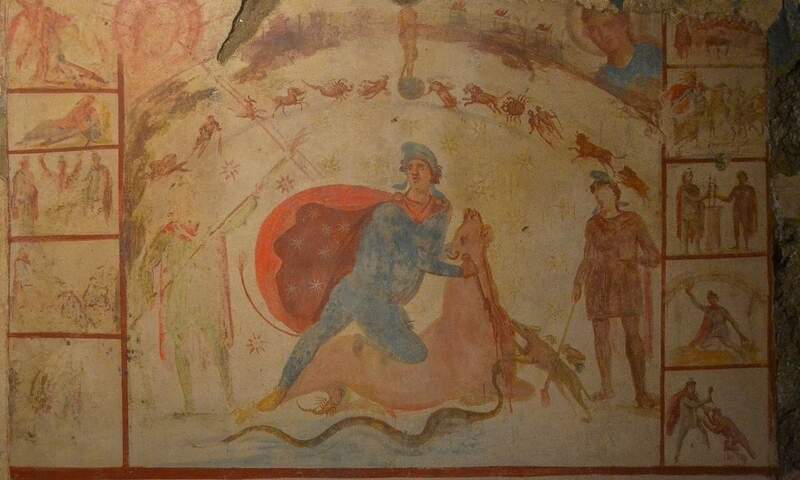 The mithraeum under the Barberini Palace has a spectacular and well preserved fresco (photograph below) that depicts Mithras stabbing a bull in the throat, called tauroctony (after the Greek word for ‘bull killing’). Entry to this mithraeum is only possible on the 2nd and 4th Saturday of each month, with a guided tour (more information). Following extensive restoration costing €360,000 the mithraeum of the Baths of Caracalla were opened to the public in November 2012. The Baths of Caracalla are quite simply amazing, and are well worth a visit. Entry to the mithraeum is not included in the entry fee for the baths, and opening hours are much more restricted – hence booking is strongly advised. Guided tours are offered at 10:00 am, 10:30 am, and 1:00 pm. The Castra Peregrinorum mithraeumwas discovered in the early 1970s beneath the church of Santo Stefano Rotondo. This mithraeum is only open by appointment, at the church. The artefacts recovered from excavations are on display in the museum of the Baths of Diocletian. The mithraeum under the Church of Santa Prisca is known for its remarkable frescoes. It was found by the Augustinian monks in 1934, and underwent extensive excavations between 1953 and 1966 by Dutch archaeologists. 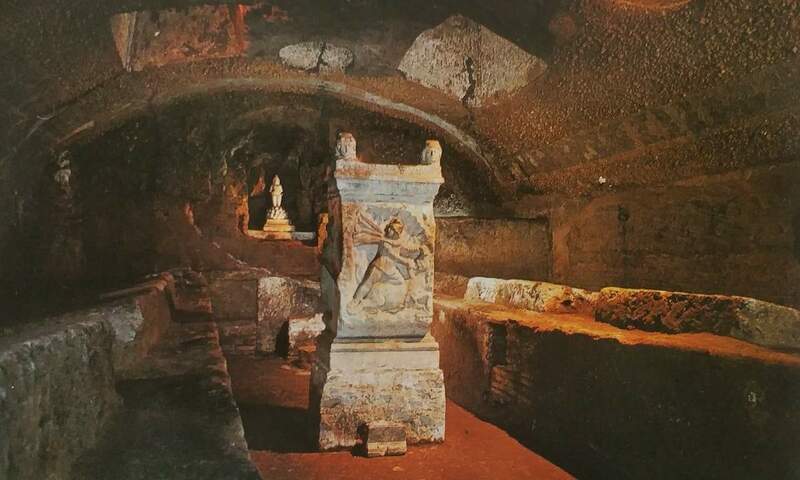 As with the mithraeum under Saint Clement Basilica, this mithraeum was also built win a private residence – and some believe that this was the private residence of Trajan before he became emperor. The site is open for visits on the 2nd and 4th Sunday of every month at 16.00 pm for individuals and 15.00 and 17.00 pm for groups (more information, and booking details). Last entrance to the excavations 30 minutes before closing, morning and afternoon. Visitors are permitted entry in small groups, with a wait of a few minutes between each group. 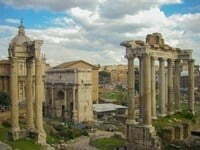 More Archaeology & History in Rome: When it comes to archaeology in Italy, there really is no place like Rome, also called the Eternal City. If you are looking to ease yourself into the best and most popular archaeological sites in Rome, have a look at the suggested top ten attractions to visit. Once you have ‘done’ those, then move on and explore the history and heritage of the city further – find more suggestions and ideas with this more complete list of archaeological sites and museums in Rome. I began my career as a travel agent, but over the years I gained a broader experience in the travel industry. In 2002 I retrained as an editor and set up my own copy-editing and proofreading business, Charwell Proof Plus. When not wielding my editor's pen, I like nothing more than exploring ancient and sacred sites. For both business and pleasure I have travelled widely and visited some great archaeological sites in the United Kingdom, Europe and the Middle East.